2018 update! It appears that Bassaka Air has stopped running flights with less than 24 hours notice. And unfortunately, it is the same manager that I had to argue with for weeks over a refund (read on below for more details) that appears to be in charge of this customer service debacle. If you have been affected, I would suggest requesting a chargeback with your credit card company as soon as possible rather than hoping that Bassaka eventually delivers, because if you wait too long it might be too late. And in the meantime, check out our post on how to get from Phnom Penh to Siem Reap (and vice-versa) and find an alternative. A taxi may be the safer choice! 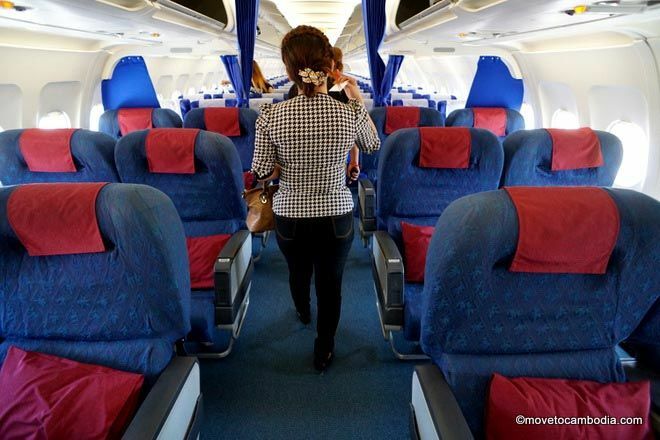 2016 update: There’s been an influx of new domestic airlines in Cambodia in the last year. Usually domestic airlines don’t seem to last more than a few months in Cambodia, so we haven’t bothered reviewing them. 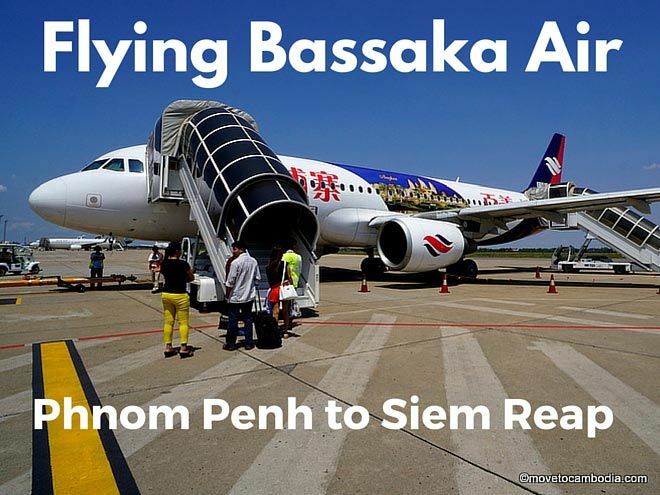 In the last year I’ve flown Bassaka Air’s Phnom Penh-Siem Reap route several times — here’s everything you need to know. Bassaka Air currently flies from Phnom Penh to Siem Reap and Siem Reap to Phnom Penh. They also have a Phnom Penh to Macau route — the airline is meant to ferry Chinese gamblers to the Kingdom of Wonder — with flights going to Macau a couple times a week. Tickets are ridiculously cheap compared to the previous route monopoly-holder Cambodia Angkor Air, with flights on Bassaka starting at just $19 each way and averaging less than $50. Bassaka Air used to be another airline you’ve never heard of, PP Air. They rebranded and have relaunched as Bassaka Air. The airline is a joint venture between NagaCorp (the casino, etc.) and the Chinese government. 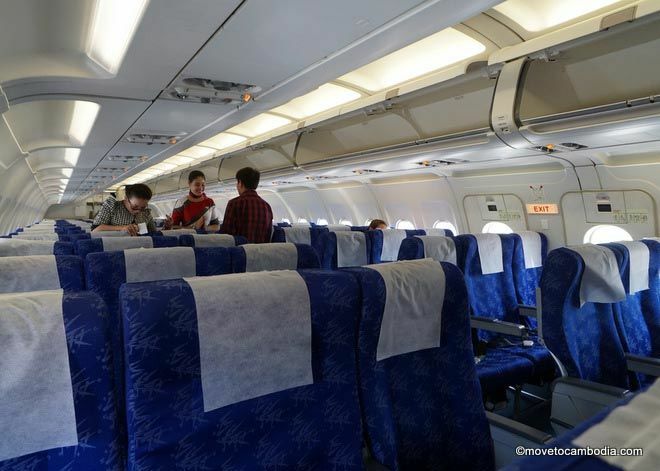 The airline has two planes, A320-200 Airbuses, that were formerly owned by Vietnam Airlines. The A320-200s are big planes that seat 168 passengers, and as such the trip is much shorter than Cambodia Angkor Air and Bayon Air, who both fly this route in smaller, slower propeller planes. Bassaka Air flies the A320 Airbus, the biggest plane on the Phnom Penh-Siem Reap route. This also means you can actually bring luggage onto the flight, which is difficult in the smaller prop planes that don’t have regular-sized overhead compartments. Plus, every ticket comes with a checked bag allowance of 44lbs (20kg). The larger planes are generally considered safer as well, but just because the plane is safer doesn’t necessarily mean the flight is safer. There have been concerns expressed about Bassaka Air’s safety standards, and there are (unconfirmed) rumors that most of their pilots are still in training. On my recent flight the check-in desk closed 35 minutes before boarding (but they recommend arriving at least 45 minutes before the flight departs). Some form of ID is required to fly, but a photocopy of a passport sufficed in my case. Boarding began 30 minutes before the flight left. The planes have 12 business class seats, which start at $94 each and offer no added service that I noticed. But you can’t put a price on face, I suppose! During the flight passengers are given a bottle of water, which is difficult to finish because the flying time is so short. We touched down just 35 minutes after leaving Siem Reap. Inside the Y cabin on Bassaka Air’s A320 plane. My only major complaint is that Bassaka Air has terrible customer service. I purchased a ticket from Phnom Penh to Siem Reap, and when I received my confirmation it was for a Siem Reap to Phnom Penh ticket. I called immediately to change it, and a customer service agent hung up on me mid-call, and when I called back five times and no one answered, nor did I get a response to the half-dozen emails I sent. Finally, I went to the Bassaka Air office in Phnom Penh to try and resolve the issue. The staff member there told me that they had no record of my phone calls, that no one had hung up on me, and the website I had submitted an email through must have been fake, because they don’t have a ‘contact us’ form on their site. After much back and forth, I asked her to bring up the “real” website on her computer and lo and behold, there was the contact form. Trying to regain the face she had just lost, she then said that I should have contacted them through a different email address that was not listed on their website or anywhere else. Eventually I got in touch with the foreign manager, and after much back and forth over a period of weeks where he said he would waive the rebooking fee but then charged me the rebooking fee, where he didn’t respond to emails for days or weeks at a time, he eventually issued me a new ticket going in the wrong direction. By the time he fixed it, the price of the ticket had gone up and he requested that I pay the difference (for his mistake). Usually I would think a thing like booking a ticket in the wrong direction was due to user error, but after dealing with Bassaka Air’s customer service team — who lied at every possible turn to cover their mistakes — I’m not so sure. Business class. Four times the price for an extra couple of inches. Overall, though, flights on Bassaka Air are good value for money (as long as you don’t need to interact with their staff). But there are a few more caveats. Domestic airlines flying in Cambodia tend to fold very quickly, with more than 15 small airlines popping up and then disappearing over the last two decades. For this reason, it’s probably not a great idea to book flights more than a few weeks in advance, in case the airline goes under. Despite the popularity of the route, we’ve heard that Bassaka Air are planning to cancel their Phnom Penh to Siem Reap Route. Also, it’s very unclear if safety standards are upheld (and Cambodia has had domestic flights go down in the past). It’s generally agreed that Cambodia Angkor Air is the safest of the airlines operating domestically, but I’d put Bassaka in second place behind them. 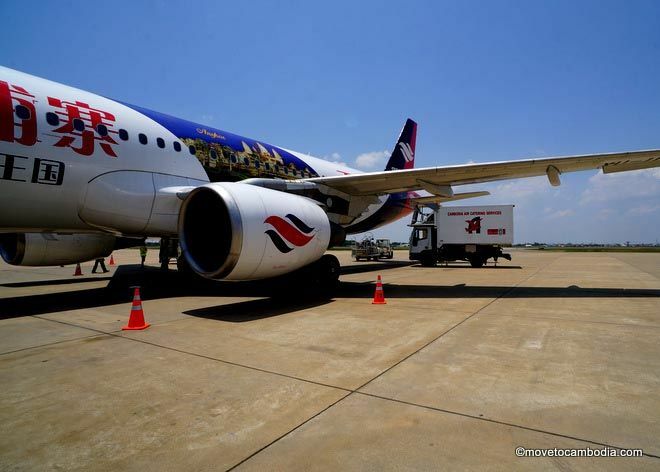 Phnom Penh to Siem Reap: daily, 9:20 a.m. Additional flights on Sundays, 11:20 a.m., 3 p.m.
Siem Reap to Phnom Penh: daily, 10:55 a.m. Additional flight at 4:35 p.m. on Tuesday and 7:55 a.m. on Friday. On most days, there is just one flight per day in each direction between Phnom Penh and Siem Reap, but it’s worth checking online to make sure the schedule above hasn’t changed. Flights can be booked online at the or through most travel agents in Cambodia, and based on our experience above we’d recommend that you use a travel agent. Flight date changes cost $15 plus fare difference, and tickets can be cancelled for a $20 fee. Be warned that there are several imposter websites already, so if you book online, make sure you are at the real site. Want to compare all of the airlines flying between Phnom Penh and Siem Reap? Read the Phnom Penh-Siem Reap flights blog post. This entry was posted in Transportation, Phnom Penh, Siem Reap and tagged Cambodia Angkor Air, Phnom Penh to Siem Reap, Siem Reap to Phnom Penh, Bassaka Air, Cambodia airlines. Bookmark the permalink. Looking for historic only one aircraft ( they had 3 ) , the XU118 , i dont understand the last date … “Fly one” bought it already? File a credit card chargeback with your credit card company before it’s too late. there are errors shown no matter how i key in my first name and last name. May i know how to solve? I am a Singapore chinese whose name is LEE LI QUN in my passport. Seems the web site doesn’t allow the use of US credit or debit cards. Would you still recommend this airlines as of now? The last corresponding from this page was years back. Will be travelling to Cambodia this Nov. Taking our 1 years old daughter and 3 years old son along. This post is from less than a year ago.